WASHINGTON, DC -- The United States on Tuesday urged Ukraine to free former Ukrainian prime minister Yulia Tymoshenko after she lost an appeal against her seven-year jail sentence on charges of abuse of power. 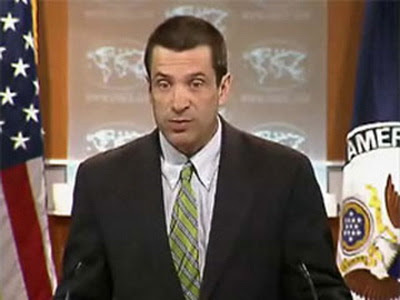 State Department deputy spokesman Mark Toner. The US State Department said it was "disappointed" by the Ukrainian court's ruling, adding that Tymoshenko and other former government officials who are in detention should be able to participate fully "in political life." Tymoshenko, the leader of the 2004 Orange Revolution, was sentenced in October for abuse of power while prime minister in a case that was launched just months after she lost a close election to President Viktor Yanukovych. Her sentence was upheld on Friday. State Department deputy spokesman Mark Toner said "the United States was disappointed that the Kiev Court of Appeals upheld the conviction of Yulia Tymoshenko on December 23." Washington was also disappointed that the court "did not address concerns about democracy and rule of law raised in the initial trial and sentencing," Toner added. "We urge the government of Ukraine to free Mrs Tymoshenko and the other former government officials currently in detention," Toner said. "We believe that they should have an unrestricted ability to participate fully in political life, including next year's parliamentary elections," he said. Late last year, the Ukrainian authorities detained Tymoshenko's former environment minister, interior minister and deputy justice minister. "Washington was also disappointed that the court "did not address concerns about democracy and rule of law raised in the initial trial and sentencing," Toner added." - This is quite interesting after President Obama and a majority of US senators have helped pass the NDAA authorizing the US government to imprison US citizens indefinitely and torture therm if they are subjectively defined as 'terrorist sympathizers" i.e., criticize the government. Mr. Warden…..if that is your name……..you sound like a Muslim. Your rhetoric mirrors that of the cold war era and the mentally unstable jihadist.